Attention Houston families with deaf and hard of hearing children and the professionals who support them: Let’s all celebrate the last days of summer together before heading back to school with a Sugarland Skeeters game and gathering on August 2tst hosted by Texas Hands & Voices Guide By Your Side. Let’s end the summer with a big hit! 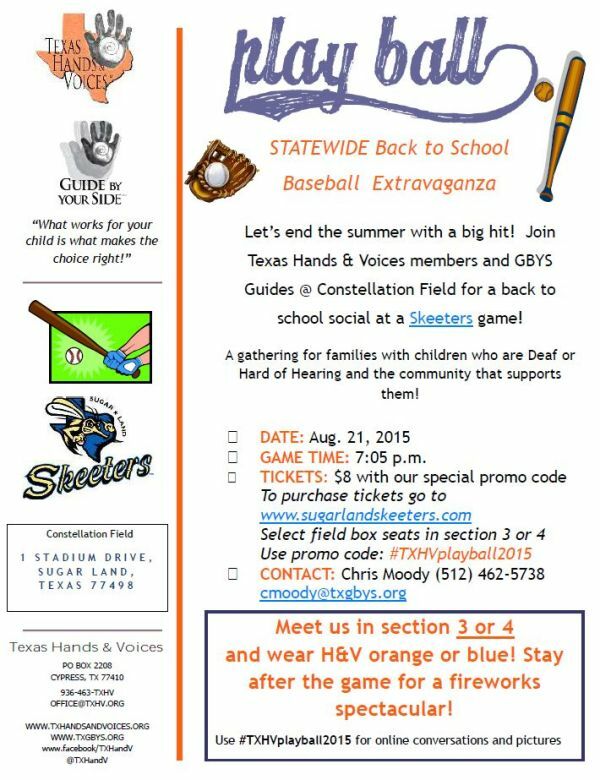 Join Texas Hands & Voices members and GBYS Guides @ Constellation Field for a back to school social at a Skeeters game! A gathering for families with children who are Deaf or Hard of Hearing and the community that supports them! Wear orange or blue and look for the GBYS T-shirts and sign. Contact Chris Moody at (512) 462-5738 or [email protected] with any questions.